Next up in our quick review of food trucks at The Porch at 30th Street: TACOS! For more on The Porch and why we think it's awesome, see our intro posts on What's to Eat at The Porch and two other trucks, MacMart and Jimmies Cupcakes. 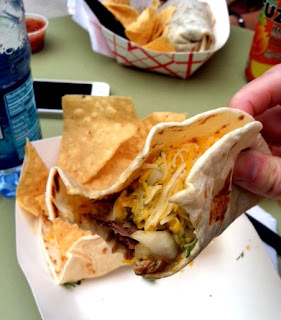 This new food cart serves well-stuffed burritos, ensaladas and tasty tacos. For $6.75, I got two yummy barbacoa pork soft tacos with pickled red onion, ancho sauce and salsa, plus a small handful of white corn chips and fresh salsa (the 75 cents was added for cheese). It was plenty of lunch for me and frankly one of the cheaper food truck options these days. Three tacos with chips are $8. Tacos come in a soft or hard shell, with the typical menu of options: chicken, al pastor, carne asada, pork, ground beef or veggie. No fish. 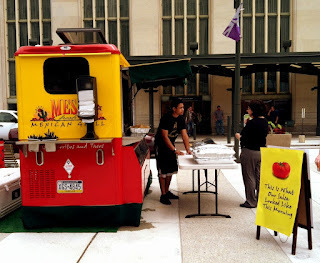 Love the sign - "This is what our salsa looked like this morning"
At right, a Mesa Fresh soft pork taco with cheese. Mesa Fresh and Taco Mondo are not on the Porch schedule for the rest of this summer, but follow them on Twitter for other locations. Like all the trucks are doing these days, I'm sure we'll see them at festivals and night markets galore. 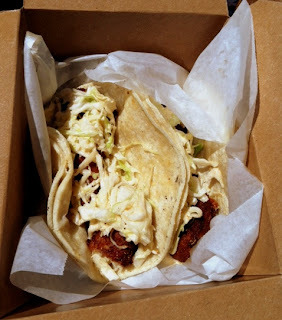 If you're near 30th Street, Penn or Drexel and have a taco craving, seek out the dependably delicious Cucina Zapata at 31st and Ludlow for a short rib or Cap'n Crunch fish taco.